Happy birthday, Chuck! Still the handsomest, goodest boy! Happy Birthday !!! to both of you!!! Happy Birthday, Charlie & Shreve! Best wishes as you celebrate another year! Health & happiness to you both! Happy Birthday to you both!!! Enjoy your steaks! Love my Daily Coyote…thanks to both of you!! Have the best birthdays!! Wow! Where has the time gone? Happy birthday to the luckiest coyote on earth. You were meant for each other. Happy birthday – and many happy returns to you both! Wow. Which means 12 years I’ve been enjoying all of you, loving the farmily from afar in distance and very close in spirit. Happiest of birthdays to you both. Happy Birthday to you and to Charlie. 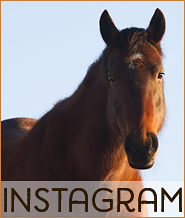 Your posts and photos have brought much joy these past twelve years. CELEBRATE BIG! YOU GIVE US MUCH JOY AND WE WISH IT RIGHT BACK TO BOTH OF YOU. AWWWW Happy Birthday to BOTH of you!!! Love you BOTH!!!! Happy birthday to you both! Beautiful picture of Charlie – he looks great. Hoping that your steak is yummy. Happy Bithday to you two! Have so enjoyed following you from the beginning! Love and hugs to both! Wishing you both a very happy, healthy and fully pleasurable birthday and many more like it! Enjoy! I certainly have loved learning a bit about coyotes and a way of life so very far and different from my own; so thank you! Happy birthday Charlie (I can’t believe you are turning 12!!!) and Shreve! Wishing you and Charlie a very Happy Birthday. I have been following the both of you ever since I read your first book years ago. Happy birthday Charlie! We both share same birthday!! Happy Birthday to Charlie and many more to come. Wow. A steak. No coyote ever had it that good. Is he getting his raw or grilled? omg, happy birthday to the both of you!!!! I too am celebrating my birthday this week, cheers to a fantastic week! HAPPY Birthday to you and Charlie!!! Happy Birthday Charlie! Wow….You’re a lucky boy. 12 years old…..fantastic! I’ve treasured every moment of these twelve years and the love for Charlie, what a journey it has been–happy birthday to both of you! I love this photo, Shreve! And happy birthday to both of you! Happy, Happy, Joy, Joy to both you Shreve and you.!!! Shreve! It has been great watching Charlie grow up! Happy Birthday S & C!!! It was destined to be. Many wishes for joy, love and time together in the coming year. Aren’t you breaking new scientific ground here, Shreve. 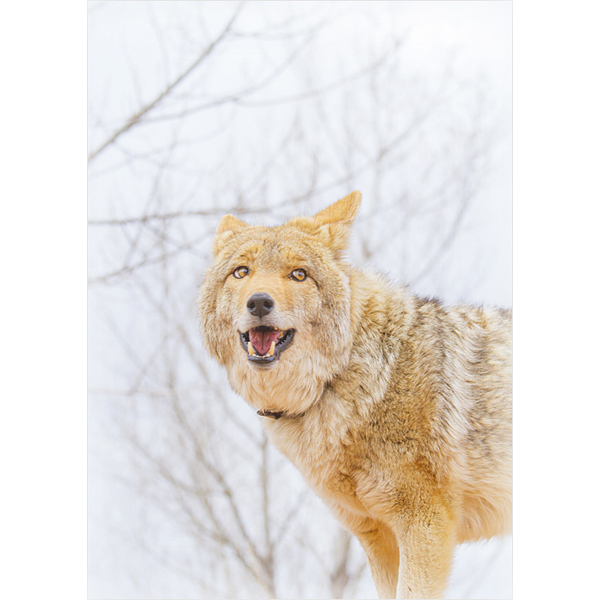 Has anybody studied coyote longevity in captivity? Happppppy happpppy to you both. Happy Birthday to both you and Charlie. We hope you both have some wonderful celebrating this week. Thanks for the share. Have a great birthday week. Happy Birthday Shreve and Charlie! Enjoy the steak. Yay!! Happy birthday to both of you ! Happy Birthday to You and Charlie. I read your book twelve years ago and fell in love with Charlie and Your adventurous life. You are an amazing woman, thank you for sharing your life through Charlie and your other special critters with all of us. Blessings to you and your family with love. Happy best Birthday to you both! Happy birthday to you, merry birthday to you! May all your good dreams and fine wishes come true! How can it be twelve years already?! Wishing you and Charlie much joy! 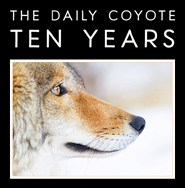 Ten years ago I read Daily Coyote every day. I was blogging then. Things change and work shifted and I hadn’t read about Charlie for years and then came back today. Seeing how he is doing well was like seeing photos of a long lost pet. I am so glad you take care of each other.